Courchevel, in the French Savoie region, is one of the most exclusive ski resorts in Europe. 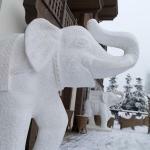 Founded in mid-1900 as a resort for anyone, it has lately become a favorite place for the European jet-set, with local 5-star hotels among the most exclusive in the mountains of all Europe. Courchevel is not merely a ski resort. Courchevel is the home of luxury, a place where exclusivity is the watchword. French Savoie’s ski resort during the winter, in the Tarentaise Valley, Courchevel is divided into five districts between 1300 and 1850 meters. The available skiing area is immense: there are 150 kilometers of ski runs in Courchevel - with almost 200 ski lifts - which become more than 600 km including other stations in the district "3 Vallees". The tracks are easier on the plateau of Courchevel 1850, while the most challenging are in Chanrossa and Saulire Combe. For snowboarders, the daily appointment is at the park Le Plantrey, at canyon of Les Verdons or at Biolley. The country is divided into five villages with names depending on their height, Saint-Bon-Tarentaise 1100, Le Praz (Courchevel 1300 ) Courchevel 1650 (known as 'Sunny Moriond' because sunny for most of the day), La Tania and Courchevel 1850 with its super luxury 5-star hotels. Of course, there are also areas for departure and landing of small planes and helicopters. All the villages are exclusive resorts with world-class shops, but the best of Courchevel is on top, at 1850 mt of altitude, with restaurants, clubs, shops, boutiques and showrooms of high-level, always busy both in summer and winter by the French and European bourgeoisie. This is a truly international country, with British, French and Russian residents, and a massive 15% from dozens of other nations. Accommodation in Courchevel is easy to find, because there are dozens of hotels, but at the same time difficult, as advanced reservation is always required; prices are medium to high, up to those very expensive nine 5-star hotels in Courchevel 1850. 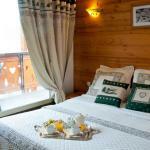 Hotel Manali offers direct access to the famous ski slopes of Courchevel 1650. On site you can enjoy the spa, complete with swimming pool, sauna, turkish bath and a modern and fully equipped fitness center. Hotel Les Monts Charvin, housed in a charming Savoyard chalet, is situated in the heart of Courchevel, renowned for its ski resorts. The surrounding area offers many possibilities for recreation and sport. 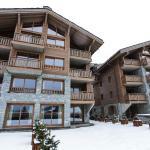 In a superb location in the mountains of the Alps, the charming Hotel Mercure Courchevel welcomes you. From here you can admire panoramic views of the Massif Saulire on a golf course and Lake Biollay.